Miniature Horses are a hardy fun breed with personalities somewhere between a dog, goat and a horse! But don't let that fool you - they are still horses! 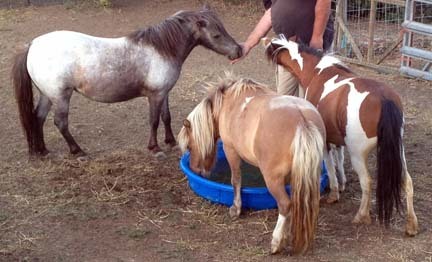 They may be small, but they require much of the same care as a large horse (feed is really the only major difference). Minis can live into their 30's, so these are long lived creatures, and thought needs to be given to that as well. Are you prepared to have a Mini be part of your life for the next 10, 20+ years? Please consider all of what Mini ownership entails BEFORE you fall in love and buy your first Mini! Your best bet - BE INFORMED!!! I. What is My goal in adding a Mini to my life? If this is what you want, you can adopt a Mini for a few hundred dollars from a rescue or purchase a registered one from a reputable breeder with your budget and taste dictating what you get. Either way, you still want a sound horse (healthy, good temper, straight legs, good bite, no major defects), especially if this is going to be your only Mini. Personally if you can get two. Horses are herd animals and no matter our good intentions, we cannot be with them 24/7). So when you are deciding, make sure to get one you that really tugs at the heart strings and that you want to spend time with and you should enjoy that time! I think I want to breed Minis? Are you knowledgeable about breeding horses? If not are you willing to learn or send your mare out to be foaled out? Are you willing to put in the time to learn what a good horse is (conformation, attitude, pedigree, etc. ), and what sells? Do you know what breeding involves? Are you prepared to wait 320-340 days and deal with the potential loss of a foal and/or beloved mare? Can you care for and handle a stallion or are you willing to send your mare(s) out to be serviced? Are you prepared to care for foals that don't sell? * We've been breeding for 20 years and it's very rewarding, but you can have some horrific moments with a dead foal and grieving mare, or sending a mare off to have a c-section. It's not for the faint of heart, and most definitely NOT so your kids can experience the beauty of life! Watch a video, seriously. I really want to show! First decide, do I want to show at local and/or open shows for fun OR regional/nationally competitive breed shows. Do you want to show in halter classes? Driving? Performance - hunter/jumper, liberty, in hand obstacle? Do you NEED to win? Or is this for fun with your horse and with friends? Besides the glory of winning is the expense. If you're showing for fun, then get a horse you want to have fun showing! If you want to win big - contact a few trainers around the country and find out what the overall cost is fit, train and show to the Nationals or Worlds. Driving is a big investment. Either getting your Mini properly safely trained (months for green broke, years for a safe CDE competitor) OR to purchase a well trained Mini can run many thousands of dollars. Have you driven before? If not, take a couple of lessons to see if it's for you! Are you looking to compete in CDE? Breed shows? Or just have a safe driving Mini for fun? Do you need a trained horse? Do you know how to evaluate a good moving horse? Good work ethic? Your best bet is determine which driving venue interests you (attend some shows/clinics/events) then locate a trainer that can find you a well broke horse. If you want to have one trained from the ground up, just keep in mind you cannot compete/drive a horse under three, so if you get a youngster it's a long term investment of time and money getting them safely trained. II. You have your goals, now what? Unfortunately much of the horse industry is 'buyer beware'. Educate yourself! Look at ALOT of Minis in person and online! Research online! There are websites, forums, Facebook, Twitter, Yahoo groups all with members willing to help you learn! III. So what is involved with owning a Mini? Minis are adorable, cute, sweet, affection and smart, but they are horses, not dogs and cats. Don't let their size fool you. They are strong creatures and if not taught manners can be willful and lead to problems. Think little dog vs big dog. Too many people let little dog breeds get away with behavior that would be completely unacceptable in the big breeds. Same goes for Minis! Biting, kicking and general disrespect is learned and easier to stop in the first place than to fight and retrain later! IV. Where is my Mini going to live? (three sided roofed to a fully enclosed stall/barn). Secure fencing that is Mini escape proof and neighborhood dog proof too. Large predators can be a problem in some areas, but most Mini attacks and deaths are attributed to neighbor dogs or feral dogs. (especially if you're on a small lot with neighbors!). Fresh water as well a salt and mineral block must be available 24/7. If you live in the city limits check your zoning! Minis are classes as exotics in some place/other zoning as horses. f you plan on boarding, check around and find out what the costs are. Some stables do discount for small equines, most do not. Ask around and get references on how the stable is run as well. Minis are a magnet at a boarding facility for all the kids. Make sure you are comfortable with the extra treats, handling, etc., your Mini may receive. V. What are some expenses of owning a Mini? Wardrobe - a ranch halter and lead, along with blankets, hoods, etc. Horse trailer and something to pull it, converted van or ? The average care expenses will run between $250-1,000 a year or more. This is without anything catastrophic happening. If you are considering breeding there are a whole bunch more things to consider! Consider carefully before buying as the purchase price can be the cheapest part about owning a Mini! There are a myriad of resources out there for people new to horses and/or new to Minis. Miniature Horses, A Veterinary Guide for Owners & Breeders, Rebecca Frankey, M. D. **Get this one for you and one for your Vet! There are tons of other books, but those are the bare minimum - IMHO! Along with these, there are numerous breeder websites and both Miniature Horse registries - AMHA & AMHR have resources for Mini owners. Getting a solid education in owning and caring for a Mini BEFORE you buy, will make the whole experience much better for you and your horse! Please feel free to email me any questions you have about buying or rescuing a Mini. I'll be happy to help or at least point you in the right direction!